Guilty of using your phone while driving? Well, a new social media post says beware, you can now be hit with a $1,000 fine if caught. But is it true? Lots of questionable claims circulating online, before you share anything, make sure it's fact checked, that's where the Verify team steps in. A viewer came across a post that he wanted to know if it was legit or not. The post claims motorists caught using or even holding phones while driving will be fined $999 and receive a three-year license suspension due to a new 2019 law. So this claim does not state specifically where the supposed law is in effect or what the name of the law is, so Verify researchers checked with officials in the DMV about if it applies here. The Metropolitan Police Department said they are unaware of any such law or policy of $1,000 fine and three-year suspension for having a cell phone even though recently proposed traffic policies for 2019 have not been implemented. This supposed law also does not exist in Virginia, however, there is pending legislation making its way through the Virginia General Assembly right now concerning hands-free driving and such with a fine no more than $500. Now in Ontario, Canada new distracted driving laws for 2019 says holding a cell phone while driving is against the law motorists can receive $1,000 if a summons is received or if you fight the ticket in court and lose. Also, a first conviction can get you a three-day suspension, not three-year suspension like the viral meme claims. 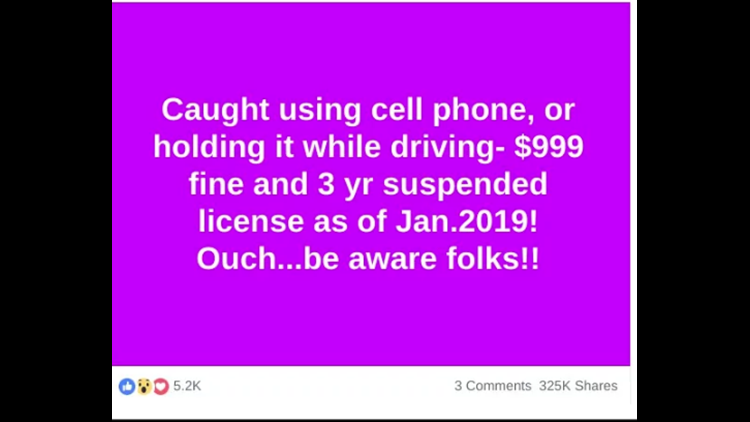 So we can verify there is currently no nationwide or local law that slaps drivers with a $1,000 fine and three year suspension for using cell phones.